Shinobi was originally released in the Arcades in 1987 alongside other titles such as After Burner and Thunder Blade. There are five missions that consist of four stages each and your objective is to free the kidnapped children. You have punch, kick and shuriken attacks but rescuing kids will occasionally reward you with a katana slash or gun; having the latter is a big help as it kills most enemies in one hit. One of the most enjoyable things about Shinobi is that it features multiple floors that you can switch between on the fly. This adds an element of strategy and forces you to methodically work your way through the level. There's a nice mix of horizontal and vertical platforming stages and lots of variety in the level design. While the first-person bonus stage doesn't look as impressive as it once did I still love the mock scaling effect as the ninjas get closer to the screen. Sega did make some minor changes for this home console port, the main one being that there are no longer any one-hit kills; instead, you now have a health gauge and it takes multiple hits to lose a life. This is a great idea as the game gets really tough towards the end. The music is unbelievable and Sega did a fantastic job porting the tracks over. While it's a shame they didn't include the speech samples from the arcade version it's understandable due to space limitations. 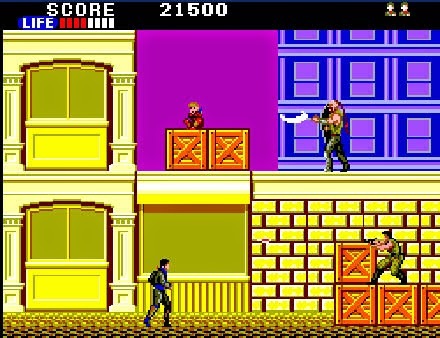 I would have given Shinobi a 9/10 score were it not for the final boss battle against the Masked Ninja. He has several transformations but the charge attack is ridiculous as it's almost impossible to hit him without taking damage. After 70 minutes, about 150 lost lives and a complete stroke of luck I was finally able to win by accidentally cornering him. It's such a shame that the last mission leaves a sour taste as the rest of Shinobi is beautifully crafted and an incredibly enjoyable experience. Sega did a masterful job porting the title from the Arcades to the less powerful Master System and it's seriously impressive how little they left out. Random trivia: If you enjoy this game I'd highly recommend checking out another Master System title called Alex Kidd in Shinobi World. It was released in 1990 and is an excellent parody of the original Shinobi game with many of the same bosses and music tracks!